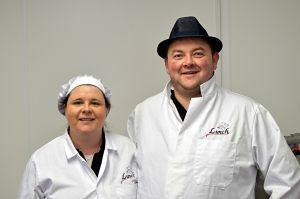 is a small family run business with over 50 years catering experience between the team. We pride ourselves on the quality of both our food and service (always with a smile!). Our priority is to have happy customers. Local suppliers and produce are used wherever possible including our local award winning 100% gammon ham which is even massaged for extra tenderness and flavour! Our newly fitted premises meet all hygiene standards and all deliveries are made in a temperature controlled vehicle. We also have a level 3 health and hygiene certificate that was passed with merit. We realise everyone has different needs so our menus are not set in stone and we would be delighted to discuss your individual requirements. We also realise that sometimes last minute orders are needed & we would do our very best to accommodate such a situation. Please feel free to drop us a line anytime - we look forward to hearing from you.